Have you been looking for a way to revitalise your house’s appearance and make it stand out? Are you looking for something that is easy to install? You wouldn’t mind getting protection against a range of weather conditions and having a significantly more comfortable patio? Patio pergolas are the perfect solution for you. 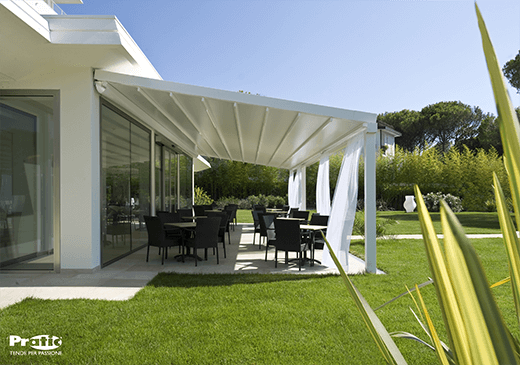 Shades Awnings provides a range of pergola styles that are not only super fashionable and en vogue, but also very useful and practical. They protect you from rain, strong and harmful sunrays, and strong wind. Not only will you get an extremely stylish addition to your house, but also a nice, comfortable, and agreeable place for you and your family to gather and spend some gratifying time together. We also make sure they are extremely stylish. Our internal design team is full of highly skilled artists who use the latest and greatest technologies to digitally create the pergola for you. You’ll be able to check it out on your own to see how it looks in relation to your house. We’ll only proceed to create your bespoke personalised pergola after we’ve made sure you’re entirely happy with it, and in no longer than two weeks, our team will be ready to come over and install it when it is most convenient for you. Contact us now and let us help you decide on the type and style of your patio pergola. Putting our pergolas through an endurance test in a Pininfarina wind tunnel with a simulated wind speed of 90km/h should show how much we care about the durability and quality of our products. From the highly sturdy Nordic pines used in creating the frames of our Pergola Wood to our waterproof and wind-resistant British PVC, we made it our mission to scour Europe for the best materials and bring it home to create the highest quality products in the UK. It’s not just the materials though, as we use the latest techniques and technologies to make efficient use of the material and create a unique product. For instance, the aluminum frame we use in our Pergola Opera, Pergola Big and Pergola Level is supported by stainless steel parts, so it appears fashionable while still being extremely sturdy. The advantages of a patio pergola are innumerable. Aside from the obvious advantages of sunlight and rain protection, which the unpredictable weather in the UK makes it necessary. They are also a great choice if you’ve been thinking about installing Solar Panels, due to their vast projection and sturdy frame. Say hello to enjoying your garden while saving energy and going green at the same time. If you are not a fan of solar panels, we have options for you too. 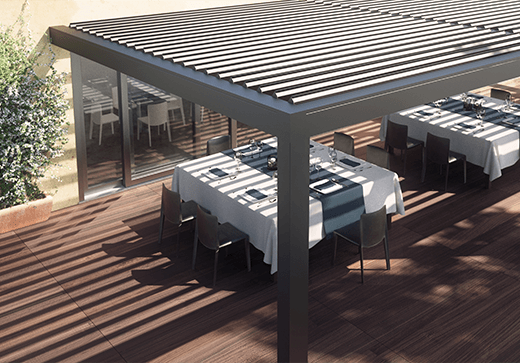 Our high-end Pergola Opera comes with adjustable sunscreen blades that you can rotate up to 140 degrees. The blades are easy and simple to adjust, which means you have the option of enjoying the shade with your family whenever you want or you can let the sunlight through keeping your house warm and saving energy.